This page is for the original version. For the updated version, see Sonic CD (2012). Use Korama's Sega PC Reloaded Installer to automatically turn off the disc check. Simple and easy-to-use launcher with many options and tweaks. Korama's Sega PC Reloaded is an fan-made installer, launcher, and patcher for some of Sega's older PC games. It fixes the need for Sonic CD to launch in 256 Color mode (not natively possible on later Windows OSs), creates the necessary .ini file to turn off the game's disc check necessity, and enables Vsync to maintain the game's original gameplay speed, among other features. 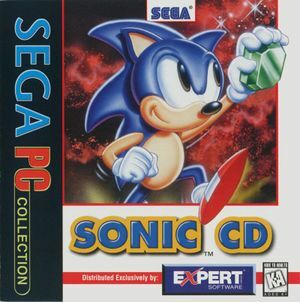 Insert the Sonic CD disc into your CD drive or copy the GAME folder from the disc into your computer. Download Sega PC Reloaded from the link above, run the launcher, select the Install Game option, and then select Sonic CD. Select the Select source option from the menu to install from the disc or the folder containing the game's files, then you will be asked to find the drive letter where the disc is located (e.g. D:\) or the game folder, afterwards the launcher will then ask you to create a new folder to install the game with the patches. Alternatively, you can install the patches into <path-to-game> by selecting the Already installed option to patch the game. If the Sega PC Reloaded launcher has detected the game, you can adjust the settings as you see fit, then click Launch! to play the game. You should see "Korama's patches active!" appearing on screen when launching the game. Upscales from 320x240 (or 640x480 with Sega PC Reloaded). When using Sega PC Reloaded, the game can be either upscaled with nearest neighbor scaling or half-tone stretching, but the latter can cause the game to slow down; the game can also be either be rendered in 4:3 or stretched-to-fit. Toggle with F4 or set through Sega PC Reloaded. Sega PC Reloaded runs in borderless fullscreen. Use Sega PC Reloaded; V-sync method can either be normal or reversed. It is recommended to use VSync on high display rate systems in order to preserve the game's proper gameplay speed. Game speed is tied to frame-rate, anything higher than 60 FPS will be unplayable. Esc is always used as a Jump key. New movement and jump keys can be set via the F7 Change Controls menu. Exiting the game requires keyboard or mouse. Music volume controls are present in the Sega PC Reloaded Launcher settings. SFX can only be turned on or off. Can be enabled in the Sega PC Reloaded launcher, the game will automatically pause when focus is lost. This page was last edited on 29 March 2019, at 10:49.